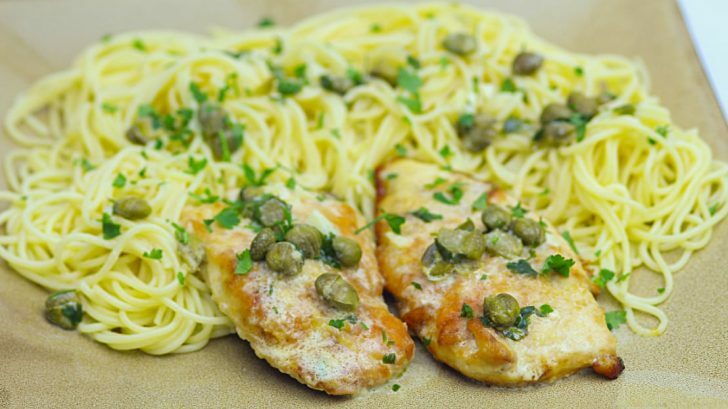 Chicken Piccata: a deliciously indulgent Italian meal everyone loves. The crispiness of the chicken, all of the flavor from the wine, lemon, garlic, butter, and capers… what’s not to be obsessed with? In fact, I love this meal so much that I knew I had to have a great recipe to give to you guys. So, we came up with this, and let me just tell you, this is one of the best chicken piccatas, if not THE best. Wanna make it yourself? Here’s how. Start by butterflying your chicken breasts, covering with plastic wrap, then tenderizing them with a wooden mallet until it reaches equal thickness. Add salt & pepper to taste. Then, cut them in half. Dip the chicken breasts into your flour, then pan fry them in your olive oil. Once those are cooked, take out the chicken and add your white wine to the pan, followed by your butter. After that melts, add your garlic to the mix, followed by your capers, lemon juice, chicken stock, and heavy cream. Let that simmer for a while until it thickens a bit. Add your chicken back into the pan, along with your parsley. Place the chicken and your sauce over your angel hair, and it’s ready to eat!